1. I don’t like going downtown, thus the absence of much down there. 2. This is just Vancouver proper, there are many great sushi places in Burnaby, Richmond, Coquitlam and beyond. 3. While I’m always up for trying something new, I tend to base my impressions on a select group of items, some of which aren’t sushi at all: Tuna & salmon nigiri, dynamite roll, spicy agedashi tofu, tako sunomono, anything with eggplant or octopus, spicy tuna roll, and likely whatever the special is. Despite my enjoyment of the dynamite roll, I never order tempura. I enjoy a good motoyaki but rarely shell out for it and tend to avoid teriyaki dishes, though I like all sorts of Japanese soups. 4. I’m not rich. Most of these places are your low-medium price point spots. I guess you want the top ten? Ebisu – This place is great during the daytime and somehow becomes way overpriced in the evening. I go there all the time, but never past 2:30pm. 10. Tomokazu – Despite me giving it a thumbs down on Urbanspoon, I figured this list should have an all you can eat sushi spot in it. I think this is the best of the bunch despite spotty service over the years. 8. Ro Sushi – This is my cheaper than cheap sushi choice. It’s right by my work and they deliver. Sure, there may have been some health code violations a few years ago (and if you ever look it up, you’d be surprised by the number of restaurants on that list), but everyone needs a place where they know your order before you’ve even placed it. CURRENTLY CLOSED? WILL IT REOPEN SOMEWHERE?! 7. 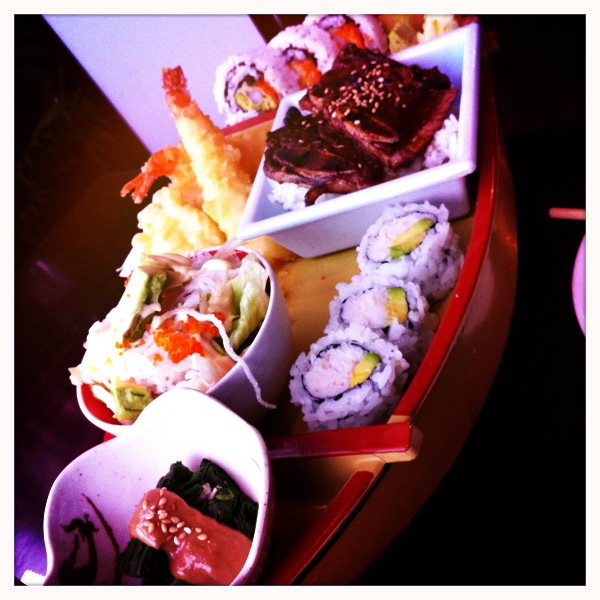 Kai Sushi Bar – This makes the list because of its proximity to my house. I could crawl there and barely skin a knee. While I don’t know how long a mid-high price point sushi place will survive such a residential area, I have to give them credit for a nice menu and consistently good service. 6. Kimbob E Ramyun – A Korean restaurant?! Well, the title of this post isn’t “My top ten Japanese sushi restaurants in Vancouver” – though sushi is a Japanese word… hmm.. Anyways, I love me some Kimbap, which is the brother/sister of sushi. Looks like it, tastes kind of like it, with similar though not identical foods inside. I’m just saying, Korean sushi is worth checking out. And cheap! CLOSED. FIND KIMBAP AT KOREAN GROCERY STORES! 5. Samurai Sushi House – ENORMOUS. Seriously. The fish is decent and the cuts are massive. 3. Shiro – Get ready to sit uncomfortably close to someone else, with bustling servers running past you. They jam everyone in, which is a good thing because otherwise you’d be waiting a long time. A great mix of price, quality, speed, and homemade wasabi – and you get pocky at the end. 2. Sushiyama – How dare I place something ahead of the renowned and line-up oriented Toshi? Sushiyama never disappoints. 1. Zipang Sushi – After recently taking out of town guests here over any other place in Vancouver, I realized it is my number one. The quality is always amazing, the menu is extensive and the prices totally reasonable. Plus I like the random decor. Pretty good list. I thought Kai Sushi Bar is kinda pricy. Will have to check out a few of these places.